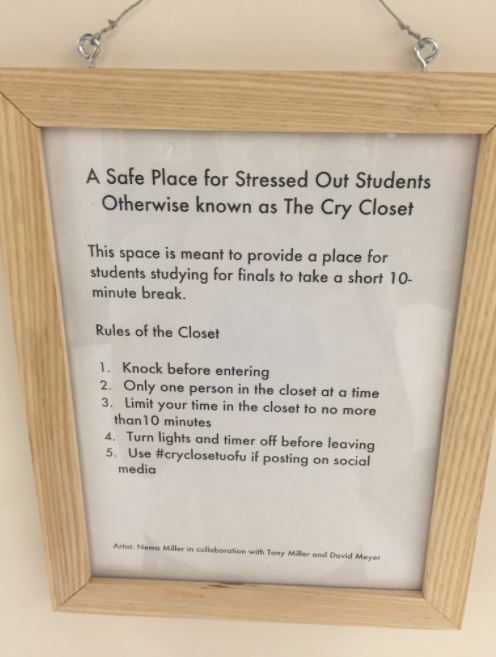 An art project in the form of a “cry closet” is going viral after being photographed in a university library. A Safe Place for Stressed Out Students, designed and installed by artist Nemo Miller in collaboration with Tony Miller and David Meyer, was shared online by Jackie Larsen. Larsen, 20, is in her third year of a cell and molecular biology degree at the University of Utah. She found the installation, including plush toys, in the Marriott library on campus. She posted photos of the closet on Twitter, where it has been retweeted more than 150,000 times. The artist even came forward. Larsen says unfortunately the cry closet will be taken down on Wednesday, but she has seen some students use it in some fashion. “I have seen plenty of students go inside and take pictures of it, but have not yet seen someone legitimately cry inside it,” she said. The university has recommended it, sort of.